The Catholic Weekly is proudly Catholic, proudly counter-cultural, proudly in favour of life. We strive to share our vision of the Church, the Lord and the life-changing possibilities of the Christian path with our readers, providing a degree of Catholic News clarity for complex times. We offer news of the Church at every level – from the parish to the world. Now, we do so in print every week and on digital platforms including our website and through social media. We also run catholicjobsonline.com.au, a national employment website. The Catholic Weekly was first published in 1945, following on the heels of the defunct Australasian Chronicle and Freeman’s Journal. Here at The Weekly we have confidence in the Catholic Church of the future, despite the at times humiliating failures and even betrayals of some of its members. We see things such as the remarkable effects of the papacy of Francis and the excitement and positivity of World Youth Day begun by St John Paul II. This is what we want to share with our readers and the world. This is the journey we invite you to join us on. 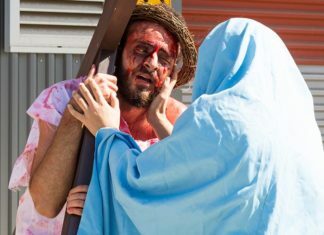 Youth at St Felix de Valois, Bankstown, set a sombre scene to their re-enactment of the Passion. Peter Rosengren is the editor of The Catholic Weekly. Catholic Weekly journalist Catherine Sheehan is an experienced writer who has previously worked for Melbourne Catholic and Kairos. Monica Doumit is the co-ordinator of catholictalk.com.au which provides clear, charitable and Catholic commentary on significant news items of the day. Mark Shea is an American author, blogger and all round Catholic savant whose writings have sometimes gotten him into trouble, but for all the right reasons. He blogs at Catholic and Enjoying It.